The bowling green is in Ala Moana Park. Ala Moana Regional Park is the current official title used by the City and County of Honolulu Parks Department. Ala Moana Park is also called Ala Moana Beach Park. It is around five minutes by bus or car from Waikiki. It can be accessed from Ala Moana Park Drive. It is across the street from the Hokua, Nauru Tower and 1350 Ala Moana apartment buildings which are in Ala Moana Blvd and close to the Ala Moana Shopping Center. If coming by taxi, let the driver know the bowling green is located "Ewa side of the tennis courts at McCoy Pavilion" and that it can be accessed from the turning circle at Ala Moana Park Drive. The bowling green is surrounded by a five feet high white brick wall. It is not readily visible from afar. In this Google map and picture the green is to the left of the circle road and McCoy Pavilion tennis courts. The green is close to the beach. Five minutes by bus or car from glamorous Waikiki, the clubhouse and green are located at Ala Moana Beach where after a game, bowlers can luxuriate in the calm, crystal clear turquoise tropical waters 100 yards from the club. Also, close to Ala Moana Park there are several restaurants and bars which are popular with bowlers after games. The green is in a public park belonging to the City and County of Honolulu. The clubhouse and the green are maintained by volunteer work from several visitors and club members. 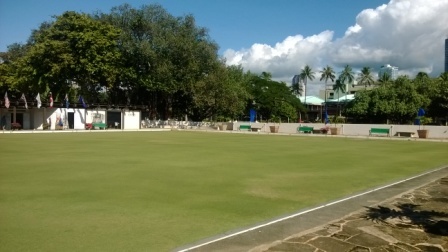 It is the only bowling green in Hawaii. The green was constructed during the 1930s for use by Australian servicemen who were stationed in Honolulu. Initially, for several years it was used exclusively by them. It has been a part of Ala Moana Park from when the park opened in 1939. In the early 1950s the green was not used for several years and became overgrown with weeds. It was restored and has been used continuously since 1956. There have been a number of different clubs using our green over the years and the current Honolulu Lawn Bowls Club was formed in 1974 from a group of players who began playing together in the 1960's. It was the first lawn bowls club using the Honolulu green to admit women members.